Tattoos — whether you have them or not, odds are you have an opinion about them. The Santa Cruz Tattoo and Music Festival invited over 100 local and national tattoo artists to shake up the community’s perception of tattoos. The festival, organized by Tattoo Tour, also gave artists the opportunity to compete with local and national artists. The exposition took place in the Santa Cruz Civic Auditorium last weekend and attracted about 2,000 people. Artists set up booths and merchandise, ready to give Santa Cruzans tattoos right on the spot. The festival included a few local and national musicians to provide entertainment for tattoo artists and their clients. An exposition like this refutes the negative connotations associated with tattoos, Hernandez said. Tattoo Tour aims to transform this stigma surrounding tattoos by showcasing artists who take their art seriously. Though Santa Cruz is socially progressive, Hernandez said, it was an “eye opener” to see how this stigma still exists. Many employers still have rules against visible tattoos, even though 14 percent of all Americans have at least one tattoo and the U.S. alone spends about $1.6 billion annually on them. Tattoo artists, with ink guns in hand and art portfolios flipped open, sat ready to increase that number and defy the stigmas associated with them. The auditorium was filled with hundreds of different styles, techniques and specialties that artists were eager to share. This gives artists an incentive to refine their skill when they are continuously exposed to other artists’ expertise from different regions. Brooklyn-based artist Uriel J. Winfree III from Hades Inquisition brought his apprentice, jewelry maker and tattoo artist Ellen Rose, to the festival to practice her skills and showcase her jewelry brand, Serpent Moon. 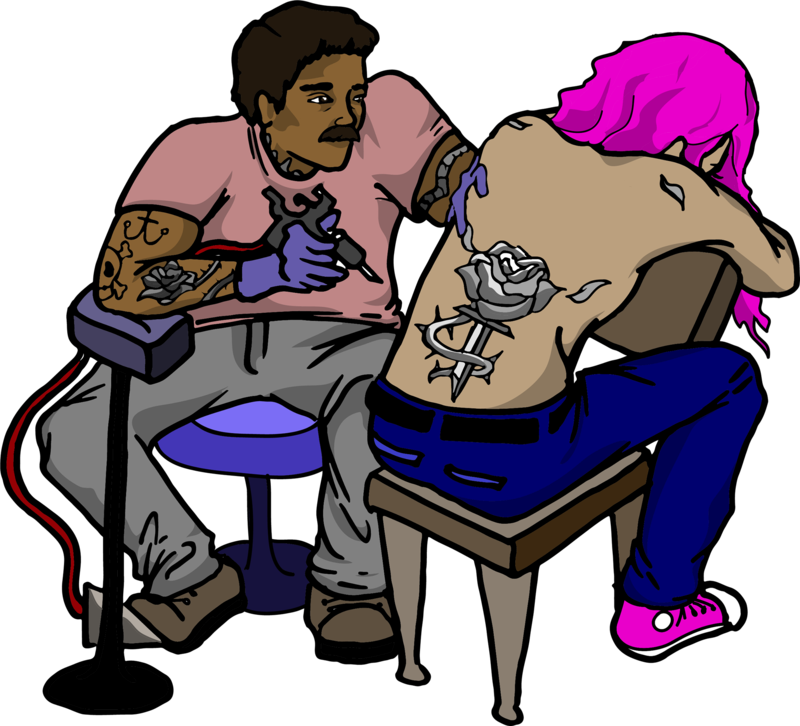 A tattoo apprenticeship involves shadowing an artist to learn the trade with first-hand experience. It usually takes a year or more. During this process, however, Rose is also establishing her jewelry designer career. Her art emulates her gothic style, whether she’s collecting organic materials, like black stones and dissected Barn Owl bone pellets, or drawing inspiration from her New York home. Tattoo styles, like bright colors from Miami and black and gray portraits from L.A., connect the artists to their hometowns. Artist Rebel Kolors from La Habra, California draws inspiration for his black and gray portrait style from his Chicanx community. Kolors specializes in celebrity portraits, with Hollywood about 30 miles away from La Habra. A customer requested an “I Love Lucy” actress Lucille Ball portrait tattoo because “that was just his show,” which placed Kolors first in one of the festival’s competitions. He proves that tattooing requires talent and thorough dedication. After he moved to Southern California from Mexico, he began tattooing in his home at age 17. Santa Cruz Tattoo and Music Festival held numerous contests on all three days to judge an artist’s past tattoos and the tattoos done at the exposition. This gives national recognition to artists and a competitive platform to local artists.